Accordingly, the ICC's brief to its Technical Committee was to come up with new ideas which could be incorporated so that the limited-overs game becomes more exciting for the public. One-Day Cricket - More Exciting??? The International Cricket Council has been working hard to draw more and more crowds for one-day internationals across the world. Except for the sub-continent, where you get massive crowds, and to an extent Australia, it's becoming difficult to draw spectators in huge numbers elsewhere. Accordingly, the ICC's brief to its Technical Committee was to come up with new ideas which could be incorporated so that the limited-overs game becomes more exciting for the public. The present system is more predictable, as very often, the result can be determined in the first fifteen overs of the game itself. The Technical Committee of the ICC, chaired by Mr. Sunil Gavaskar and comprising former international players like Angus Fraser (England), Tim May (Australia) and Arjuna Ranatunga (Sri Lanka) has recommended some innovations to liven up proceedings in one-day internationals. Their first suggestion is to permit 'substitutions', as practised in soccer. A member of the main XI could be replaced after the match begins by a substitute who will be allowed to bat and bowl. The substitute could be brought on for a tactical reason, not just if there is an injury, and at any time. 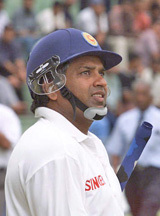 A batsman could be called in if he was scoring too slowly and replaced by a substitute. Similarly, a bowler can be called in if he is being smacked all round the park and be replaced by a substitute. The second suggestion pertains to the fielding restrictions. Under the present rules, only two fielders are allowed to stand outside the thirty-yards circle in the first fifteen overs. This restriction, the committee has stated, could be increased to twenty overs. The first ten overs of the innings will have the restriction. The fielding captain will then have the option of utilizing the remaining ten overs whenever he wants to later in the innings, in two 'blocks' of five overs each. The Committee has also recommended that the field umpires could consult the TV umpire 'whenever there was doubt'. This means that the umpires will have the option of conversing and confirming even lbw and bat-pad decisions, besides the usual 'line decisions', with the third umpire. These recommendations, if introduced, will add tactical spice to the game, but the flipside is that they will further complicate a complex sport. The ICC will be meeting in June to discuss the recommendations. The inaugural ICC Super Series, which will feature three one-day games between Australia and the Rest of the World, will witness the 'debut' of these suggestions on an experimental basis. What will happen thereafter is anybody's guess. If the consensus is that these innovations are good for the game, then they will definitely be adopted on a full-time basis.